Ocean Conservancy engages in cause-related marketing partnerships to help build awareness and raise funds for our work to protect the ocean. These partnerships give the companies’ customers the opportunity to show their support of Ocean Conservancy and contribute to our global conservation efforts. Through the support of these companies, Ocean Conservancy has been able to effectively champion science-based solutions that keep our ocean clean and healthy for future generations. Shop at AmazonSmile to support our global conservation efforts every time you buy. It’s the same Amazon.com you know—same products, same prices—and 0.5% of each purchase price is donated to Ocean Conservancy. We are teaming up with the intrepid adventurers at Breitling to keep our ocean clean and healthy. Breitling, a Swiss watchmaker, knows the time to protect the ocean is now. From March 2018 through February 2021, Breitling is proudly supporting Ocean Conservancy’s global conservation initiatives including by conducting dedicated Breitling beach cleanups as part of the International Coastal Cleanup, and also through the launch of a limited edition watch during each year of the partnership. Ocean Conservancy and byta are partnering to protect our ocean from today’s biggest challenges. From February 2019 to February 2020, byta is donating $25,000 in support of Ocean Conservancy and our conservation initiatives. The ocean covers more than two-thirds of Earth’s surface, and protecting it is a marathon, not a sprint. Ocean Conservancy is partnering with the running company NATHAN to keep our ocean clean, healthy and thriving. 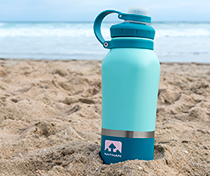 From July 2017 through July 2019 NATHAN is donating 2% of the sale price of the new HammerHead stainless steel insulated water bottle, with a guaranteed minimum contribution of $50,000, to Ocean Conservancy and its conservation initiatives. Outerknown, the sustainable menswear brand founded by world surfing champion Kelly Slater, has partnered with Ocean Conservancy to launch the “It’s Not OK!” campaign, a giveback program designed to bring awareness to environmental issues. Through the end of 2017, Outerknown will donate 100% of profits from the It’s Not OK! capsule collection, for a minimum donation of $20,000. rockflowerpaper is proudly supporting Ocean Conservancy’s global conservation efforts, including the protection of our oceans and the species that call them home, through its Blu Bag reusable totes. rockflowerpaper is donating 20 cents per Blu Bag sold with a $50,000 minimum to Ocean Conservancy through 2018. Download our Guidelines for Marketing Partnerships or contact us for more information.